Donna Allen was interviewed on the Dialogues with Dan Internet Radio Show. Donna talked with Dan Windheim (a head injury survivor himself) about her life since surviving an airplane crash. She discussed her work on motivation and more. television show, hosted by Jill Lublin on the San Rafael, California Comcast network channel 26. Messages of Hope features guests who have inspiring stories and messages of hope to share with their viewers. Donna shared, with Jill Lublin's viewing audience, her experience of overcoming her child abuse trauma and her devastating airplane crash injuries. the time to be our guest!" "Congratulations on being on TV! the way you focus on getting out there. I should take lessons from you (smile). Donna Allen was a featured guest on the BlogTalk radio show, Optimal Health Seekers. Donna shared how surviving an airplane crash turned tragedy into a personal triumph. She discussed, with radio show host, Trish Robichaud, her story of breathlessness during the airplane crash, the life trials that led her to that tragic moment, and the gut-wrenching journey that's finally given purpose to her life. Optimal Health Seekers Radio, is a show that educates, inspires, and empowers people seeking to find their own personal level of optimal health. Donna Allen was a featured guest on the internet radio show, Dialogues With Dan, on Rockland World Radio. Donna discussed with radio show host, Dan Windheim (a head injury survivor himself), her harrowing airplane crash experience and how she survived it. Dialogues With Dan Radio Show (based in Rockland County, New York) focuses on issues that affect people with disabilities. It is about the history, focus, and future of people with disabilities and what makes then who they are. Rockland World Radio is the premiere on-line internet radio destination for Rockland County's Independent Music, Art, and Culture. and I look forward to your book!!" advice in many areas of disability and strength. her LinkedIn.com network: Disabilities - No Limitations. Donna Allen has been named "Influencer Of The Week"
Donna Allen was a featured quest on the BlogTalk radio show, Conversations LIVE, hosted by radio show personality Cyrus Webb. Cyrus Webb welcomed Donna Allen to Conversations LIVE to discuss how she has been able to survive not only child abuse but how surviving a plane crash has changed her life as well. Donna Allen was a featured guest on the Life Beyond Trauma Podcast Radio Show on Success Talk Radio hosted by Dr. Melody Brooke. Dr. Brooke is an accomplished and respected psychotherapist, a gifted speaker, a talented actress, and teacher. Donna shared, with Dr. Brooke's radio listening audience, how she survived the trauma of her airplane crash accident and the trauma of her child abuse experience. we spent together on the show. It was not only fun but touching to me." A radio interview broadcast of Donna Allen along with a panel of guests, on the subject of women and disability, was aired on The Women's Magazine Show at KPFA radio station in Berkeley, California. sent me and you come across very well. Donna! Good luck in future Interviews. Donna Allen used her speaking skills when she spoke before 100's of people (approximately 500 in attendance) at The University of California at Berkeley at a memorial for, and in celebration of, the life of Barbara Shearer, a renowned concert pianist and one of the San Francisco Bay Area's prominent music professors. Mrs. Shearer was an immensely popular performer, and her Bay Area concerts regularly attracted overflow audiences. To Donna, Mrs. Shearer was a teacher, a mentor, and a friend. Donna's was the most moving." Donna Allen was interviewed, quoted, and photographed, at The UC Berkekey Alumni House on the campus of The University of California at Berkeley, by reporter, Safi Wa Nairobi, of The National Minorities with Disabilities Coalition for their promotional calendar. 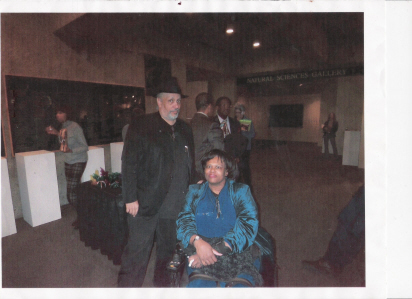 Donna Allen and best selling author, Walter Mosley (Author of the famed 'Easy Rawlins' series), posed for a photo op, held at The Oakland Museum, during an author-speaking event surrounding Walter Mosley's release of his new and final book in the 'Easy Rawlins' series: 'Blonde Faith'. "It's hard to write about trauma. It's even harder to move beyond it. On the Heal My PTSD website page, Making the Shift: Survivors Share Coping Techniques, Donna Allen contributed her thoughts and her recovery tips on how she deals with the anniversary date of her airplane crash accident. Heal My PTSD's series of sharing how survivors relate to, reclaim, and manage their traumatic PTSD dates, serves as the final installment, which gives the last word to survivors of trauma. Donna Allen was featured on the Fearless Nation PTSD Support Group website with a mentioned link to her resent radio interview about surviving and thriving after her airplane crash experience. The Fearless Nation Organization was founded so that people, who suffer with Post-Traumatic Stress Disorder (PTSD), won't feel alone and lost as so many have experienced. Fearless Nation's teachings, about the hard lessons that can be learned through such experience, can benefit anyone who is struggling with PTSD. Airplane Crash Survivor, Donna Allen, has been named "A Fearless Nation Role Model!" by the Fearless Nation PTSD Support Group on their 'Raising Awareness' webpage. Raising Awareness: PTSD is difficult to diagnose, difficult to treat, and current healthcare systems and social climates deter people from getting the help they need. Frankly many people believe that PTSD is not a real injury. Donna Allen was a prized winner in the 2010 Reporter Connection Member Contest sponsored by Bradley Communications Corp.; a service connecting busy journalists with experts available for media interviews. -- Donna Allen has won a Sony portable DVD player. upcoming issue - "The Competition""
Content copyright . Donna Allen. All rights reserved.